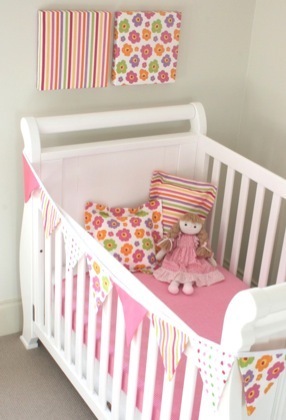 Decorating a bedroom for your new little one (or updating for an older child) can be great fun or incredibly stressful! With so much decor on the market, it’s sometimes hard to narrow it down. Here’s a little something to get you started. La Petite Chambre is the brainchild of an Australian mother, who began the range after struggling to find children’s decor she liked. At the moment, the range consists of three separate collections, one geared mainly to boys, one to girls, and one which seems unisex. 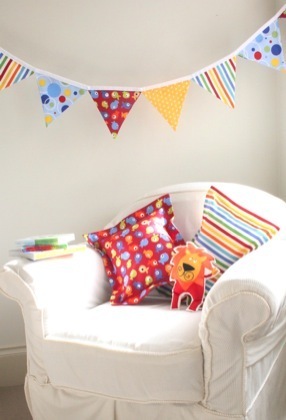 Each collection contains wall canvases, throw pillows and fabric bunting in pure cotton, but the items are all made to order and according to the website they are happy to chat with you about your specific requirements. The overriding characteristic of all the pieces is their bright and modern appeal – at home in the bedroom of a newborn, but not babyish, so you won’t need to rush out and redecorate in a year. La Petite Chambre are worth keeping an eye on and we’ll keep you informed if they branch out into other items, such as linen. Buy direct from the website here in Australia – prices start at $36.96 with a flat rate of $12 for postage and handling throughout Australia.